In the Saturday morning qualifying, held in cool conditions, Lewis Hamilton (ASM F3, Dallara-Mercedes, 1:10.496 minutes) secured his third pole position of the season and will share the first row of the grid for race one in Pau, France, with his team-mate, Adrian Sutil (ASM F3, Dallara-Mercedes, 1:11.078 minutes). Franck Perera (Prema Powerteam, Dallara-Opel, 1:11.069 minutes) and James Rossiter (Signature-Plus, Dallara-Opel, 1:11.218 minutes) secured third and fourth positions respectively. Due to the tracks characteristic, the qualifying was contested in two groups. Just like it was the case yesterday, group one was dominated by Lewis Hamilton. 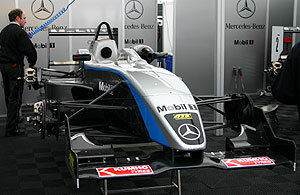 The Briton was the only of the 23 Formula 3 Euro Series drivers to set a lap time below 1:11 minutes. For quite a time, Loïc Duval (Signature-Plus, Dallara Opel, 1:11.135 minutes) held second place, but short before the session ended, the Frenchman returned to the pits and retired after having touched the wall in Lycee, thus offering Franck Perera the chance of working his way up to second place. In the second group, Adrian Sutil and James Rossiter battled it out for the lead, with Sutil getting the upper hand, at the end of the day. Late on Friday evening, the stewards decided to disallow the times set by HBR drivers, Hannes Neuhauser (Dallara-Mercedes), Maximilian Götz (Dallara-Opel) and Alejandro Nuñez (Dallara-Opel) as well as I.S.R driver Filip Salaquarda (Dallara-Opel) in yesterdays qualifying for race four, as the brake ventilation of their cars didnt meet the regulations. Furthermore, it was decided that the penalised drivers have to start the race from the end of the grid. I.S.R accepted the penalty while HBR appealed against it. As the appeal results in suspensiveness regarding the stewards sentence, the HBR drivers will start tomorrows race from the eighth (Neuhauser) ninth (Götz) and 20th (Nuñez) grid positions they had actually qualified for.